Tis the season for backyard BBQs and cook-outs. I have probably mentioned about a hundred times how much I love to chill outside on a warm (not hot. please, not hot) summer night with a cold beer and some great food. 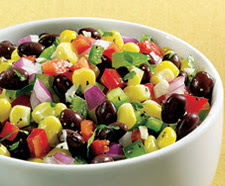 One of my favorite things to bring to a BBQ is a recipe from my dear friend, Maya: her black bean and corn salsa. Give it a try and let us know what you think! And if you have any leftovers (impossible) feel free to ship them my way. Do you have any delicious and healthy summer recipes you'd like to share? Spill! OH MY GOSH this looks amazing! I love cilantro! Would go great with my guac! Looks crazy easy to make!